In 1981 this writer wasn’t writing but was a big fan of boxing. I knew legendary trainer Cus D’Amato was working with Jim Jacobs. Jacobs was a former AAU Handball Champion who had the largest boxing film collection along with the largest comic book collection. He was also partners at the time with Billy Cayton. Jacobs at the time was managing world champion Wilfred “El Radar” Benitez. When I arrived at Jacobs Park Avenue office I suggested West Philly’s Tyrell Biggs for D’Amato to train. Jacobs said “we have a heavyweight named Mike Tyson!” I replied “I never heard of him.” Tyson was 15 at the time. As it turned out Biggs was the first Olympic Games Super Heavyweight Gold Medalist in 1984 and Tyson lost back to back bouts to Henry Tillman in the heavyweight division at the Olympic trials. Of course Tyson crushed Biggs in the professionals. 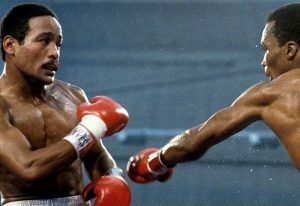 Jacobs told me how the Puerto Rican people loved and respected him for not putting Benitez in with Thomas “Hit Man” Hearns in a money fight but instead had him fight and win the super welterweight title defeating Maurice Hope, an obviously, much lesser opponent. That was in May of 1981. A year later I met D’Amato and then active boxer Kevin Rooney. I was instrumental in getting Rooney a rematch with Terry Crawley who he lost to in his last fight by suffering a bad cut. Cus said “I want to see how far back Kevin has gone.” They fought to a draw the second time around at the CYC in Scranton, PA, in a Bob Connelly Promotion. Getting back to Benitez; he was the youngest boxer to ever win a world title at the age of 17, 5 months and 23 days. He defeated Antonio “Kid Pambele” Cervantes, 74-9-3, of VZ, a fighter I still believe Duran passed over going from lightweight to welterweight. It was a split decision for the WBA World Junior Welterweight title at the Hiram Bithorn Stadium in Puerto Rico. Benitez was 25-0 at the time and followed in the footsteps of two older brothers who boxed. Their father Gregorio trained all three sons. After a pair of successful title defenses Benitez went to New York’s Madison Square Garden in a non-title bout that ended in a majority draw with Harold Weston. Benitez was stripped of his title due to not fulfilling a rematch with Cervantes due to a car accident. Benitez won his second world title in January of 1979 defeating Carlos Palomino for his WBC Welterweight title. In his first defense he defeated Weston in a rematch. Then in November he lost to “Sugar” Ray Leonard by a technical stoppage. He had a bad cut on his forehead. Benitez would win his next three fights and then knockout Hope in the twelfth round to become the first boxer in forty-three years to win three world titles in three different divisions. In his two successful defenses he defeated Carlos Santos, 23-0, and Roberto “Hands of Stone” Duran, 74-2, both in Las Vegas, NV. In 1984 Benitez finally met up with Hearns in December of 1982 losing a majority decision at the Superdome in New Orleans, LA. In 1983 his father would take over as his manager. Benitez was never the same after the Hearns fight. He won two of his next three fights and in getting knocked down by former champion Davey Moore he broke his ankle. In his next eleven fights he won seven of them before retiring in September of 1990 at the age of thirty-two, suffering brain damage. His condition was called post-dramatic encephalitis. His elderly mother took care of him until her death and his sister Yvonne. Their brother Gregorio, Jr. also suffered from brain damage from boxing. Benitez made over seven million dollars in his career but that was all gone. He was inducted into the IBHOF with a final record of 53-8-1 with 31 stoppages. ← WWE SmackDown Live highlights: Top contenders crowned, Miz & Shane McMahon, more!